Summary: Jerome is dead when the story begins, shot by a policeman. The story then goes back to the morning and unfolds in alternating sections entitled “Dead” and “Alive”. Jerome’s day, like many before it, includes an encounter with three bullies at his school. He makes a new friend that day, though, and Carlos defends himself and Jerome with a realistic toy gun. Later, Carlos lends Jerome the gun; when Jerome is outside playing with it he is shot twice in the back by a policeman. 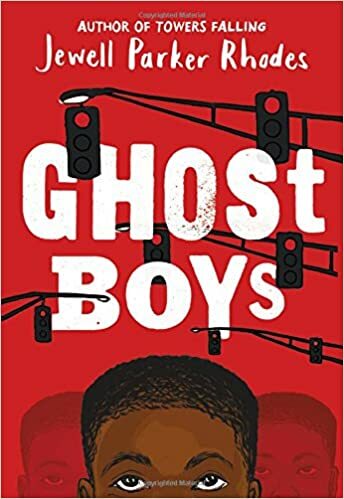 In death, Jerome encounters another Ghost Boy who turns out to be Emmett Till. He also finds his way into the police officer’s house, where the man’s daughter, Sarah, turns out to be the only person who can see him. 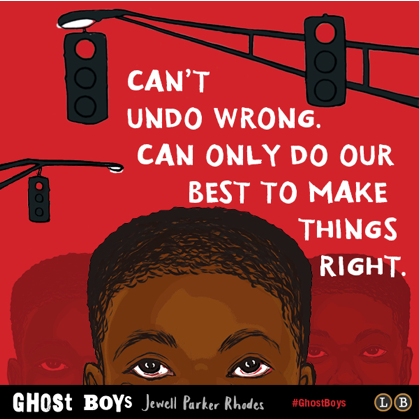 Together, they slowly learn about Emmett Till and other murdered black boys who appear to them as ghosts. When Sarah’s father’s case is dismissed, both she and Jerome must deal with their emotions and figure out how to ensure that history doesn’t keep repeating. A Day of the Dead celebration with both Jerome’s and Carlos’s families marks the beginning of healing for both families and hope that they can find a way to make Jerome’s death lead to a more peaceful world. Includes an author’s note, discussion questions, and additional resources. 224 pages; grades 5-8. Pros: A powerful story that should lead to a lot of discussion. Switching between the past and present draws the reader in quickly. The story itself, as well as the history behind it, are horrible and disturbing, but are presented in ways that are appropriate for upper elementary and middle school students to read (with guidance). Cons: The police officer’s family, including Sarah, could have been fleshed out to make a more interesting story. And it seemed like Sarah and Jerome would have just Googled Emmett Till instead of wondering what his story was and waiting for a librarian to show it to them online.